» What’s ‘wrong’ with this scene? What’s ‘wrong’ with this scene? 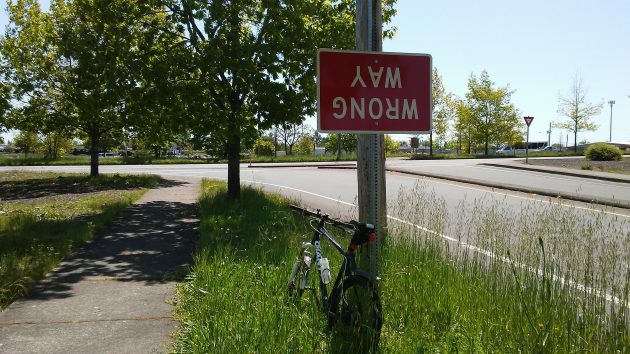 There’s not much to say about this Albany highway sign, except that, well, this does look like the wrong way to attach a sign. Was it just a question of upside-down thinking? Or was it that the installer exercised his sense of humor? The larger problem, which you failed to refer to, is the abundance of weeds growing long side city streets. These continue to be an eyesore for Albany. I wish the Council would spend as much time worrying over the underbrush as they do about the Merry Go Around. These noxious weeds can single handedly undermine any and all efforts by the City to promote Albany as a pleasant place to live. In fact, if the Council spent as much time on noxious weed control as they attempted on cannabis control, this community would be miles ahead in the effort to attract new populations. Ha ha JE! Time for you to put your BrIgHt yellow ref’s hankie back in your pants. You see the common thread in HH’s picture? Just saying’ …..